At Grange Infant School, we are very proud of our wonderful lunchtime team. The activities and games included during the lunch hour promote learning through play; where our children develop a further understanding of sharing, patience and listening. There are a wide variety of games chosen for the children to play, if they so wish to take part. These games can be split into different zones of play, concentrating on a variety of skills. Ball and cup & Catch: Concentration, perseverance and hand-eye co-ordination. Traditional Playground games are always being enjoyed at lunchtime by the children and the lunchtime supervisory assistants. NEW THIS TERM- We have recently introduced a “Quiet Area” in the Year 1 and 2 playground. This is replacing last years “Lunch Club”. The area is intended for the children that struggle with a long playtime and would previously have attended our Lunch Club. Within the “Quiet Area” there are benches for the children to sit at and read, draw and play quiet games together. They can spend the whole of lunchtime here or come and go as they feel needed. It is not a punishment or a “naughty area” its intended purpose is for children to enjoy some peace and quiet in what can be a noisy playground. All infant school age children are now entitled to a free hot school meal. The menu available can be found by clicking here. We encourage our children to take up the opportunity to have a free school dinner apposed to bringing in a packed lunch. The following links can be used when looking for Lunchbox ideas. Top Table is an extra special Lunchtime experience, one we are sure the children will strive to achieve. In the Autumn term we were delighted to be able to invite our parents into school to have lunch with their child. 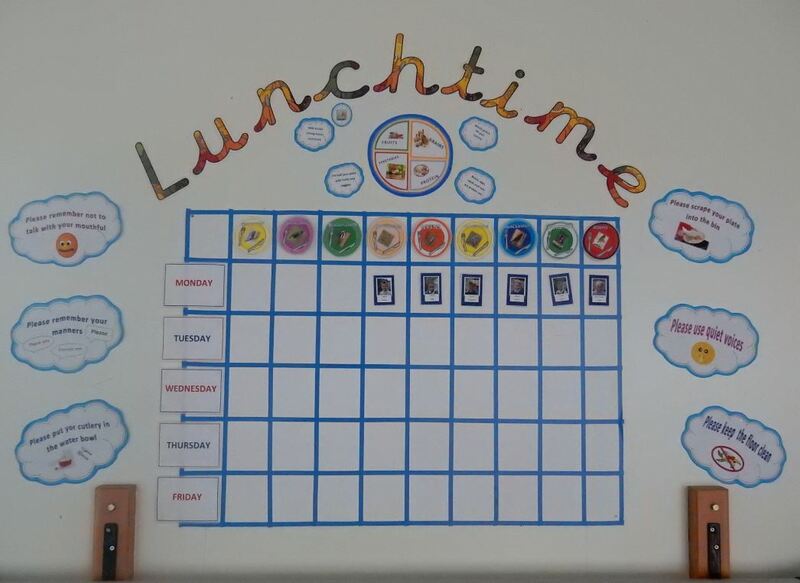 The children loved this experience and we feel it was beneficial to the Parents/Carers to see just how lunch times work at Grange Infant School. We will be inviting Parents of all years back again in the Summer term. Please look out for a letter with further information.